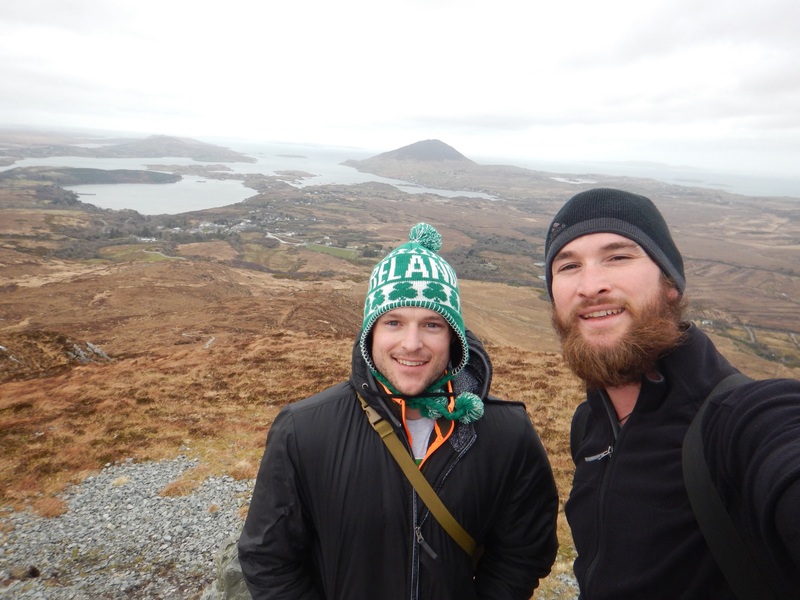 While on the east coast of Ireland, Alex and I were able to do some hiking in the Connemara National Park. Hiking to the top of Diamond Hill is the best hike in the area. It is a 7km (4.5mi) hike round trip and takes about 2 1/2 hours. 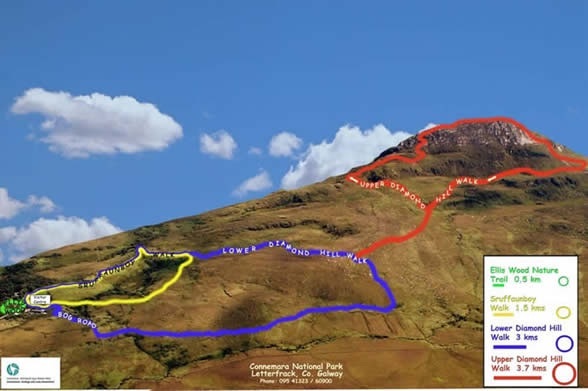 Located near Letterfrack, a parking lot is situated at the beginning of the marked trails. There are three different loops to choose from the yellow, blue, and red. 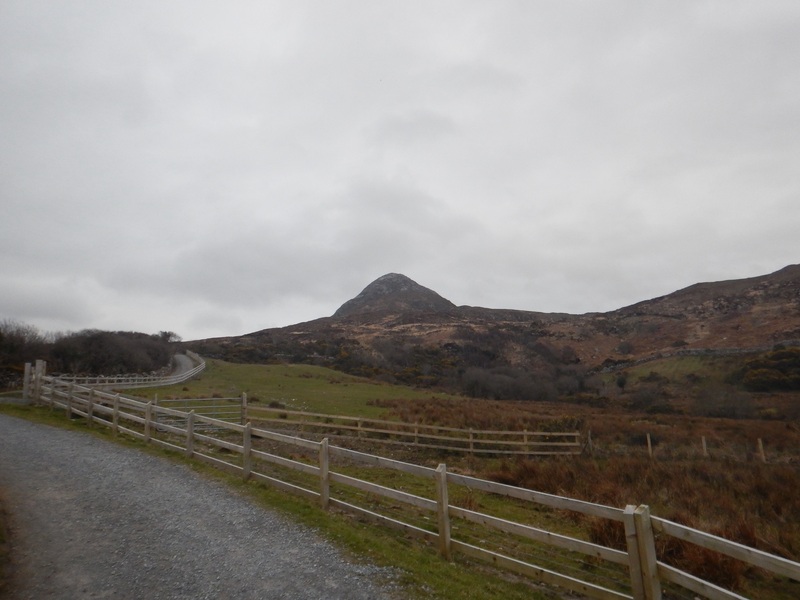 To reach the top of Diamond Hill, you have to take the red trail. Leaving the parking lot, the blue trail guides the way until it links up with the red trail. 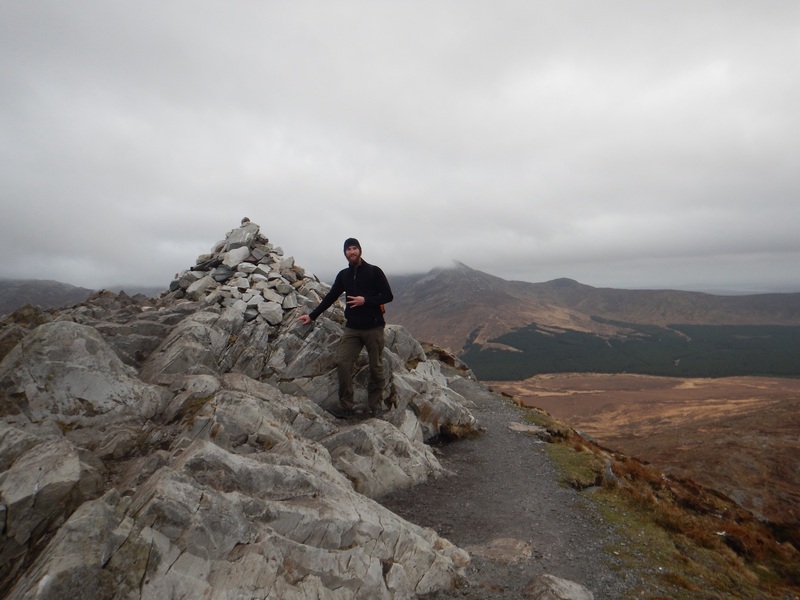 It is a great hike, well marked, and contains some wonderful views. As we hiked along it was quite windy and cold. Bringing some warm clothes was a good idea since the vegetation is minimal and the wind just howls across the mountains. 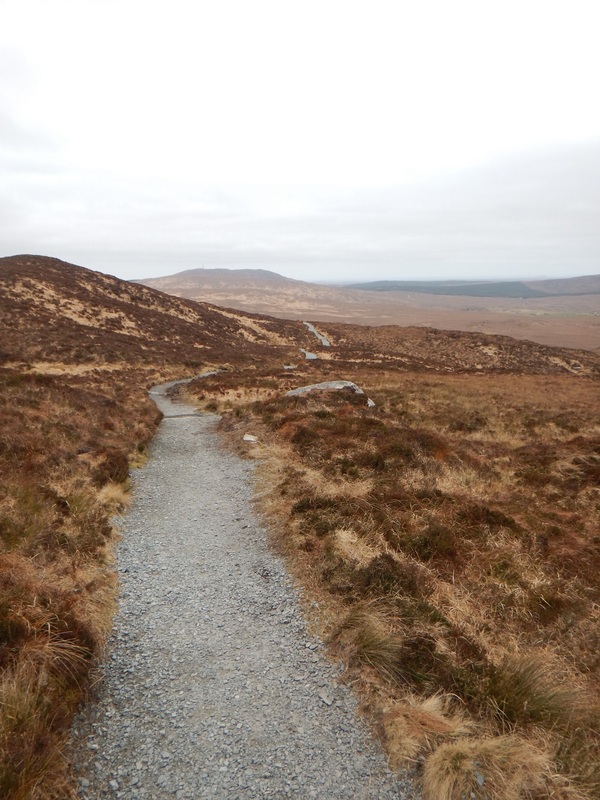 The blue trail is pretty mild and has a steady incline until it reaches its peak. This is where the red trail connects and you truly begin hiking up the mountain. Directing you in a clockwise manor, the red trail is meant to be hiked in this way as it leads you up the steep gravel pathway and many stairs. The scenery, as far as vegetation goes, was very grim and desolate while I was there in March. Viewing the surrounding hills, they were all barren with brown grass. This does not mean however that the views were compromised. As you looked west, the beautiful coastline of North Atlantic Ocean could be seen. Arriving at the top, there was indeed a diamond point right at the peak. With a full 360 degree view, the lack of vegetation made it so nothing hindered the enjoyment of the surrounding landscape. It was extremely windy and cold but luckily Alex and I were able to find a spot that half blocked the wind while we relaxed and enjoyed the views. Looking down from the top, on the east side you can see the North Atlantic Ocean. To the north, the Kylemore Abbey which is located across the valley is the highlighting sight. 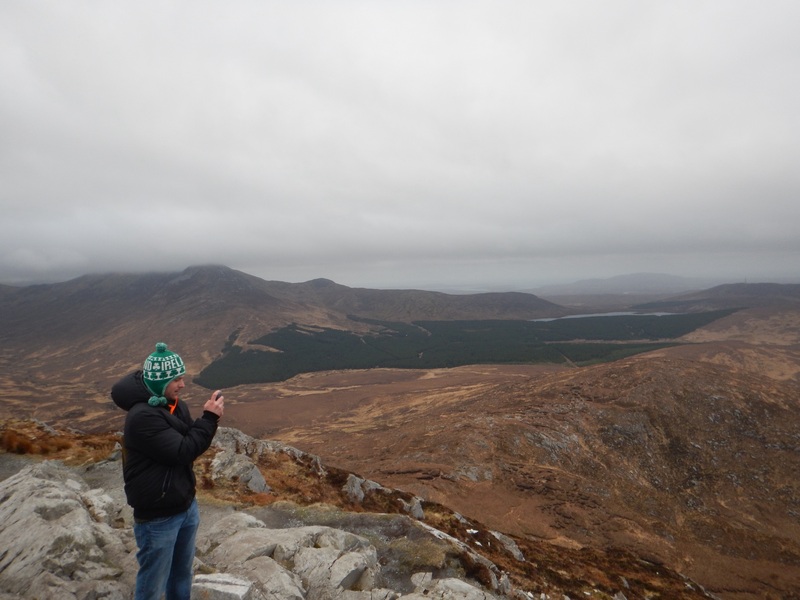 The views extend into the surrounding Connemara National Park on the east and south sides. 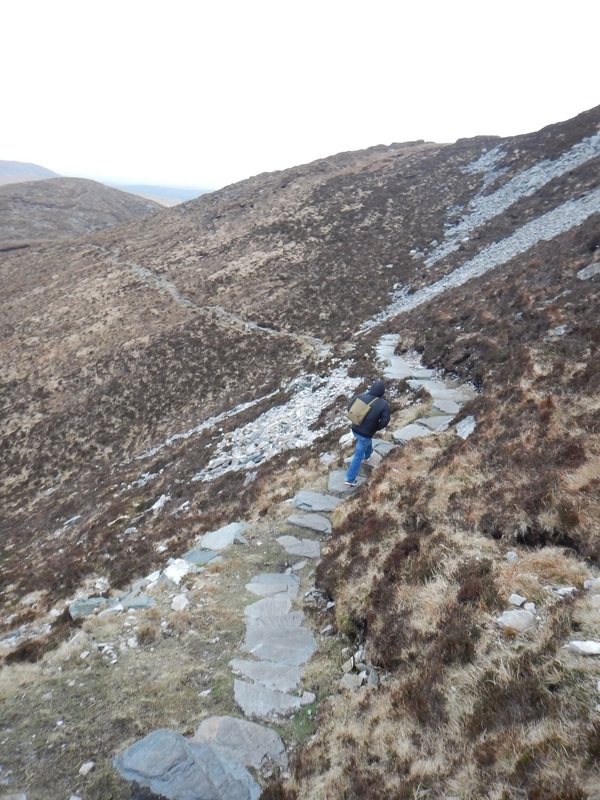 Hiking down from the top, the going is easy with a well kept pathway. 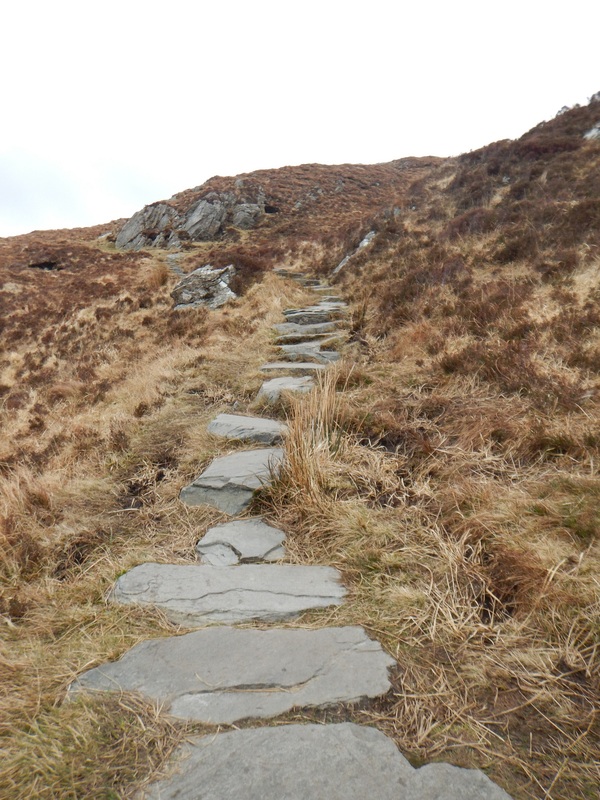 Rock steps lead the way down as well as a gravel trail. After connecting back up with the blue trail, the descent mellows out and keeps descending at a mild decline. 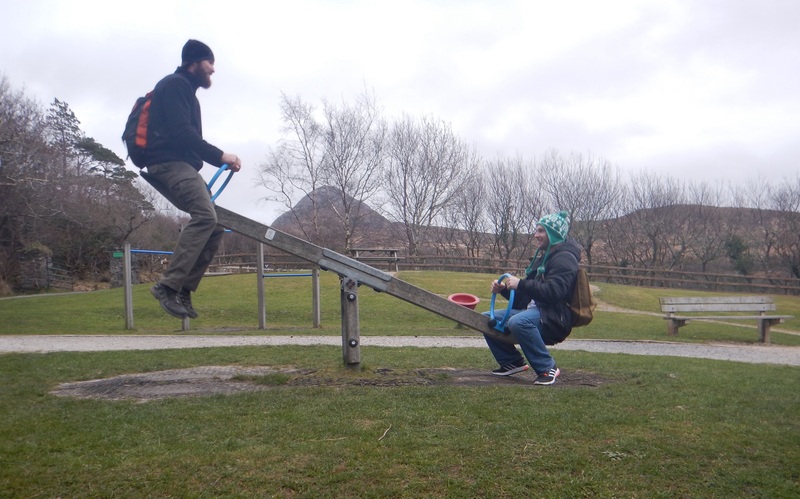 Arriving back at the parking lot, we had to have a little bit of fun at the playground before leaving.